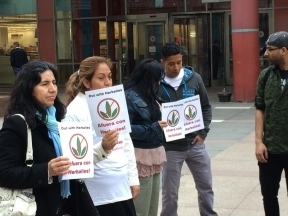 Members from the Illinois Herbalife Campaign held a press conference on Tuesday morning to urge Attorney General Lisa Madigan to conclude an investigation on Herbalife, Inc. According to the members of the campaign, more than 80 complaints were filed alleging that Herbalife unfairly targets Latinos. Attorney General Madigan began the investigation into Herbalife last April after dozens of victims from Illinois filed complaints with her office documenting the financial losses through working with Herbalife. However, many victims have felt they have not received sufficient support from Madigan’s office. The Attorney General’s office encourages victims of Herbalife to file a complaint with their office by calling the Illinois Herbalife Campaign hotline at 855-701-5437.